The running consensus is that Iran’s presidential election will have little impact on the trajectory of the P5+1-Iran negotiations over Tehran’s nuclear program. According to this view, all the presidential candidates are regime insiders who are close to Supreme Leader Ayatollah Ali Khamenei and therefore unlikely to change Iran’s negotiating position. Whatever the merits of this argument, Iran’s presidential election could have a large impact on the ongoing negotiations. Even if the new president does not change Iran’s negotiating position, his mere person is likely to make the U.S. and EU much more willing to come to terms with Iran. This is true for at least two reasons. The first is simply because he is not Mahmoud Ahmadinejad. For eight years Ahmadinejad has come to symbolize Iran in the minds of most people in the United States, Europe, and indeed the world. This has undoubtedly complicated Western policymakers’ ability to reach an agreement with Iran. Although the U.S. labeled Iran a part of its axis of evil during Mohammad Khatami’s presidency, Ahmadinejad’s calls for Israel to be eliminated, his constant questioning of the Holocaust, and his appeals to Shi’a Islam’s Messiah figure seemed to confirm the worst of what many in the West see in the Islamic Republic. It also heighted Israel’s no concern. Although the supreme leader is the ultimate decision-maker inside Iran, it would be extremely difficult politically for any U.S. president or European leader to be seen compromising with such a controversial and offensive figure as the current Iranian president. Certainly, hosting Ahmadinejad on the front lawn of the White House to sign a deal would be out of the question. Regardless of where the signing took place, Ahmadinejad would provide strong ammunition for critics of the deal to denounce it. This is somewhat unfortunate given that, at least in his second term, Ahmadinejad has been one of the most forceful advocates inside Iran of reaching a deal with the international community. As Reuters quoted an unnamed source close to the negotiations as saying, “Despite radical rhetoric, Ahmadinejad did more than all his predecessors to (try to) advance rapprochement with Washington.” Ultimately, however, diplomacy involves at least two sides and Ahmadinejad complicated the P5+1's ability to reach an agreement. Given the failure of Ahmadinejad’s overtures, his successor might be less enthusiastic about pursuing an agreement with the P5+1. At the same time, whoever wins the presidential election will almost certainly be a more palpable figure for his P5+1 counterparts to deal with. Ahmadinejad’s bombastic rhetoric was always controversial among Iran’s political elite and the presidential candidates have all signaled they believe it has only hurt Iran’s national interests. A transition in Iran’s elected leadership will give President Obama in particular space to defend cutting a deal with Iran. 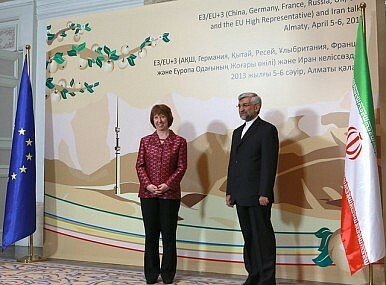 Ahmadinejad’s departure may also give the U.S. and EU greater confidence in the negotiating process as a whole as well. According to the Reuters article cited above, President Obama was always wary of dealing with Ahmadinejad because he was seen as unable to sway the Supreme Leader to his position. This view was more or less confirmed early on in Obama’s tenure when Ahmadinejad failed to get Khamenei to sign off on the fuel swap agreement the two sides tentatively reached in Geneva in October 2009. Instead, President Obama has always wanted to deal with Khamenei directly, including sending him at least two letters. While not responding directly, Khamenei has tried to signal at various points that Iran’s interlocutors with the P5+1 have his backing. For example, in the spring of last year Iran’s lead negotiator and current presidential candidate, Saeed Jalili, was given the new title of personal representative of the supreme leader. Compared to President Ahmadinejad, who has been in a power struggle with Khamenei for some time, Iran’s new president will be someone who enjoys closer relations with the supreme leader. This will be especially true if Jalili is elected. Just as Khamenei will be more likely to sanction a deal with the West if it is reached by a president who he doesn’t fear as a potential rival, the U.S. and EU will be more interested in signing off on an agreement they reach with a president who is a stooge of Khamenei. Thus, Iran’s presidential election might not change the substance of the ongoing negotiations. But substance has hardly been the biggest obstacle to the U.S. and Iran reaching a deal. Trump's Iran Sanctions Reimposition Takes the JCPOA One Step Closer to CollapseTrump Withdraws US From Iran Deal, Reimposes Sanctions: Here's What's NextRising US-Iran Tensions: Should India Be Concerned?As Presidential Election Nears, Iran's Hardliners Flex Their MusclesHow Sincere Were Obama’s Threats to Stop Iranian Nuclear Proliferation?